dot: a command extracted from Graphviz. Prod has been integrated in essentially for teaching purpose. ProdInCosyVerif services are available under the “Behavioral Verification” menu and it proposes the elements presented in the image below. Clean Persistent Files: this service cleans persistent files, it is useful if the state space is quite large or when you perform a new computation from scratch. This command does not require any parameter. To launch it, you just have to select a model using the appropriate mechanism such as the Coloane selection window shown below. It returns some information concerning the size of the reachability graph. 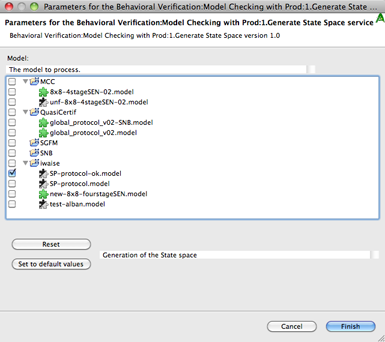 In this service, prior to select the model it concerns, you must enter a formula to be evaluated in the window shown below. 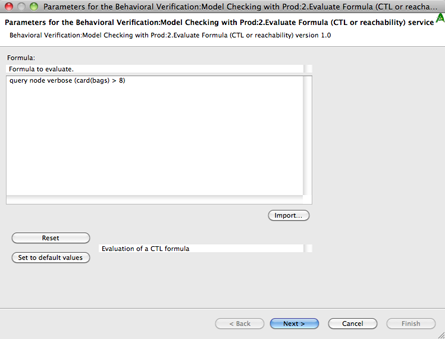 A typical answer you get in the result window (this formula was not verified on the model we selected) is shown below. To know more about the syntax of Prod, please refer to this memento. When the reachability graph is of reasonable size (up to 150 nodes), you can get a precomputed image from it (layout is computed by the Graphviz drawing tool). An example of such an image is shown below. The red node corresponds to the initial state and black ones to states without successors. Inside nodes you can find the identifier that allows you to fetch the corresponding marking via the command “Display States”. Name of the arcs are labeled by the fired transition. 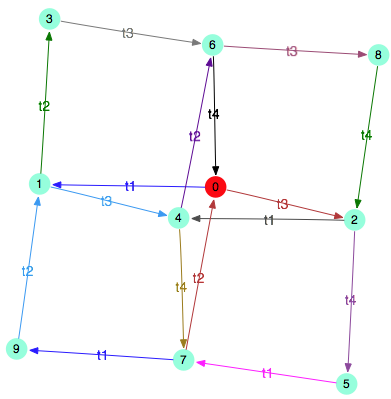 Arcs are coloured to disambiguate the relation between states in the reachability graph. This service also outputs the Graphviz description (dot format). This allows to use it and generate other formats with the appropriate tool. A pdf image is also provided (no need to recompile it 😉 ). To watch the marking associated to a state in the reachability graph, you just have to specify its id (the number allocated by prod). By definition, 0 is always the initial state of the system. Other states identifiers can be gathered via queries to prod. If you specify more than one state to be displayed, please separate each number by a space. This command does not require any parameter. You just specify, as for the “Display States” service, the starting state and the ending state by their identifier. You must specify only two states in the parameter window (separated by a space). Prod shows the path as shown below, from the initial one you specify (first value) to the ending one (last value). Arrows display the binding of involved transitions.